Your company’s website works hard. It is open for business 24/7 and is the most cost-effective way to market your products and services. Keeping it up-to-date with current technologies and content and design helps it remain the “hub” of your online presence. 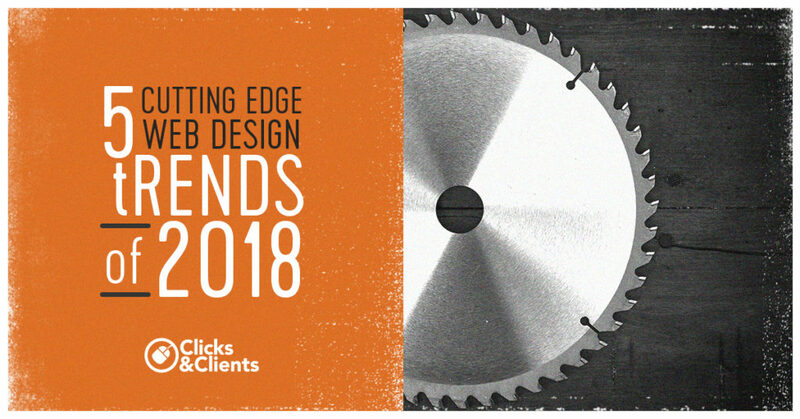 Whether you want to completely redesign your site or tweak it for a fresh look, here are some top design trends of 2018 to give you some ideas. Traditionally, websites take color cues from the company logo. It keeps the theme cohesive and helps increase brand recognition. However, starting in 2017, there was an adventurous departure from that staid practice. Vivid, saturated colors began filling device screens. From company websites to social media, billboards and print ads, color is being used to make a statement and create eye-catching designs. It’s not just solid colors that are popping off the screen. Gradients between two colors create interest and dimension to the composition. They help users’ eyes move along the screen and create mood and depth. Whether it’s a natural gradient between adjacent colors or a dynamic juxtaposition of complementary colors, these techniques catch the visitor’s attention and set the site apart from the ‘web-safe’ crowd. Flat design has run its course. While it served its purpose for a modern design approach, today’s high-resolution graphics displays and AR takes drop shadows and depth to a whole new level. The diffused shadows are a departure from the harsh lines of the past. They provide a 3D-like view, allowing designers to give subtle, complex layers to specific elements, making them stand out. No goggles needed. Fonts can be as impactful as graphics. Thanks to high-resolution devices, the use of custom fonts is on the rise. Large letters and contrasting serif and sans serif headings improve the user experience. They can help build brand identity and keeps visitors on your site longer. In stark contrast to other trends, Brutalistic designs are an extremist form of minimalism. In the digital version of the revived mid-20th-century architectural movement, excessive white space, broken or no grid layouts, and jarring colors give an unpolished feel to the content. Sites from Craigslist to the Drudge Report use this form of stripped down design to make a statement and define their purpose. Your website design can be as critical as the content when it comes to the relationship with your customers. At Clicks & Clients, we take the time to understand your goals and business needs to ensure your site works as hard as you do.